Would you step into a world filled with eerie creatures and voodoo vibes without first trying to understand what you’re getting yourself into? 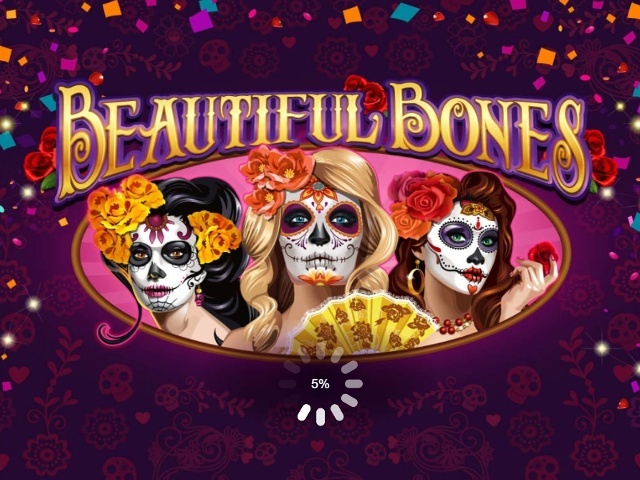 Probably not – and that’s why you shouldn’t dive into the Beautiful Bones online slot game without first running through a few basics. 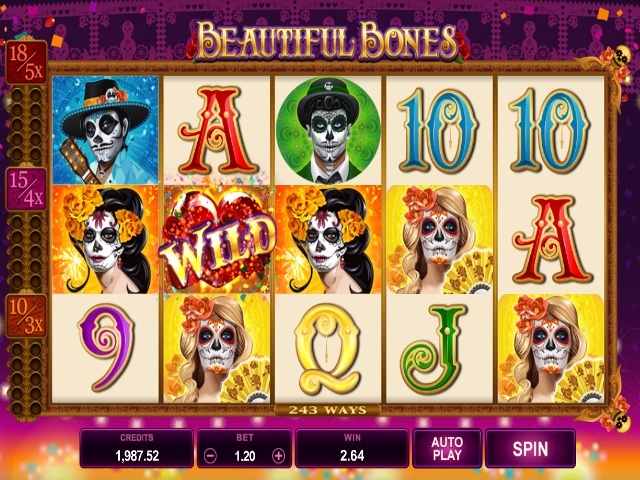 Despite offering a kaleidoscope of colour, this five-reel video slot from Microgaming has a spooky undertone that you shouldn’t take too lightly. If you really want to pluck a 300-times jackpot from this game without angering the spirits, you need to read our review of the Beautiful Bones online slot machine right now! Play Beautiful Bones for Real Money! In our world, we often hear the phrase ‘beauty is skin-deep’, but in this game’s world, it’s bone-deep. The moment you load up some credits and set the reels in motion, you realise quickly that you’re in the middle of a freak show carnival. The game is based on the Mexican holiday celebration The Day of The Dead, and at every turn you’ll see a creature or an ornately decorated soul that looks like it’s been plucked from another world. The reason the styling of the Beautiful Bones video slot stands out is because of how simple the betting system is. In a bid to maintain the mysterious vibe surrounding this game, the developers have made the betting bar as inconspicuous as possible. Instead of being filled with endless buttons and options, the only two elements you need to click are ‘bet’ and ‘spin’. With betting limits ranging from 0.30 to 30 credits, it won’t take you long to find a level that suits. Once you’re ready to roll, the voodoo powers-that-be will float across the 243 paylines and conjure up wins worth 300-times your line bet whenever you align three or more matching symbols. A slot with a single pay-out table and nothing else wouldn’t be very attractive, which is why the Beautiful Bones online slot machine features three special features. At the top of the shop, the Wild Spin Again will turn back the clock each time you roll in a win. Regardless of the amount you bank, the software will give you a free spin and a second chance to add another prize to your stack. 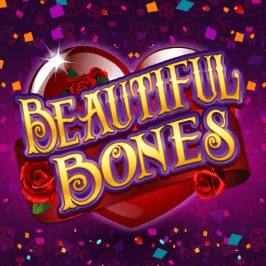 For an experience that keeps you on the edge of your seat but captivated by its beauty at all times, the Beautiful Bones slot game is a real spinner winner. Share this Beautiful Bones Review today! 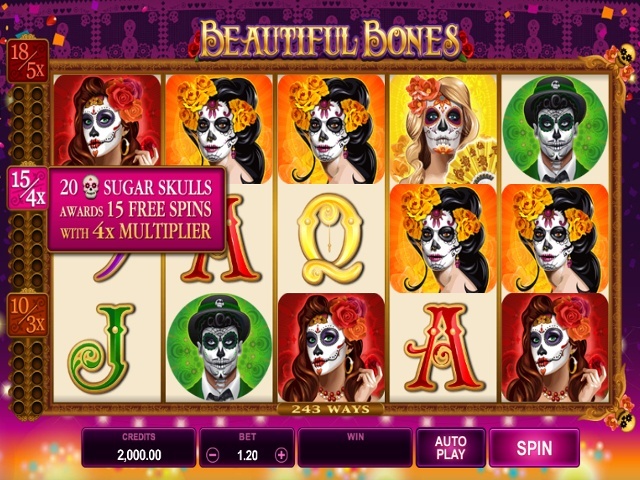 If you like Beautiful Bones, you'll love these slot titles too!